State-of-the art technology for landmine detection suffers from a variety of technical problems such as high false alarm rates, insufficient detection probability and indirect information. This results in very small clearance rates of mine fields, and, as a matter of fact, very large landscapes in Africa, Asia and on the Balkan are and will be restricted areas for a long time in the future. landmines buried in a variety of soil conditions including various types of vegetation will be detected with XBT. The most important argument for XBT, however, is the fact that XBT in contrast to all other detection methods is a direct imaging technique. This is possible because the scatter signal is directly proportional to the material density of the irradiated volume. The X-ray backscatter technology has the potential for low false alarm rates and a high detection probability. In this presentation, results obtained with a prototype scanner are given. The scanner has been tested very successfully on a German military test site. Looking at the high resolution images, a trained operator is able to identify the buried object immediately. With the treaty of Ottawa (1997), hope was raised that in the future the deposition rate of new mines may fall drastically. Amongst others, the donation of the 1997 peace Nobel prize to the International Campaign to Ban Landmines (ICBL) has also increased the public awareness of all problems related to landmines. This resulted in increased funding for mine removal campaigns and for the development of new technologies. However, as a matter of fact, there is still a technological problem in detecting the mines. It must be emphasised that landmines exist in the form of anti-personnel mines (APM) and anti-tank mines (ATM). On the long run, the treaty of Ottawa will result in decreasing numbers of APM´s in the world because production, usage and storage of such mines is forbidden in those more than 100 countries which ratified the contract. However, as ATM´s are not restricted by this treaty, a decreasing usage of those types can hardly be predicted. Detection technologies for all types of landmines are definitely needed for usage in the next decades to come. Although many different technologies are in use or are under development, there is no detector available at present which can detect mines under all circumstances and at sufficiently high inspection speed. There is a large variety of information available about existing technologies and those which are under development. An overview can be found e.g. in ref. . Up to now, the well-known mine probe still is the most common instrument for detection of mines world wide. Typically, an operator has to stick the mine probe into the ground at intervals of 3 cm. This is not only extremely dangerous but also very time-consuming. Under typical circumstances a single person can manage only a few square meters per day. With metal detectors the situation is similarly problematic for the operator. Metal detectors will detect many different types of metal not only from metal-containing mines but also nails, caps, ammunition fragments and even metallic ore in the ground. Thus, their usage is very often accompanied by a very high false alarm rate and by the high risk from undetected metal- free mines. On the other hand, these two methods are at present those most frequently used in the whole world. Besides those handheld systems as described in the previous section, there are more advanced technologies in use or under development. They are often vehicle-based and all have their strengths and limitations. Ground penetrating radar (GPR) provides a certain detection potential, but the interpretation of signals is very difficult, and the achievable detail recognition is far from being perfect. Additionally, wet soils can cause problems. With Thermal Neutron Activation (TNA) based methods the 10.6 MeV gamma radiation from activated N-14 is used for mine detection. This method reportedly has a high false alarm rate due to other N-containing material in the vicinity of the mines, and it seems to fail to detect nitrogen-free explosives. With Nuclear Quadrupole Resonance (NQR), relatively small amounts of certain types of explosives are detectable, however, up to now the most frequently used explosive TNT is very hard to detect. Additionally, metallic housings can have a very strong and unacceptable shielding function. Visual methods are also used, but have a certain probability to fail when searching for mines in deep vegetation. From the statements above it seems that no single detection technology alone is capable of fulfilling the requirements of mine detection. Hence, in several countries there are ideas or projects based on a combination of detection technologies. Assuming the best case that a well-defined combination of detection technologies will work sufficiently well, the whole system still suffers from a lack of information because all methods are indirect. They require more or less complicated signal processing and interpretation. For a user-friendly mine detection system a direct imaging technology is needed ! When X-rays pass through matter they will be attenuated, i.e. absorbed or scattered. For the purpose of this work, X-ray scattering (Compton scattering) is the effect of interest. A description of the physics of Compton scattering can be found in standard textbooks or review works such as ref. or in special publications related to the use of backscattered X-rays for materials inspection [3-5]. Although scattering can be the strongest of all attenuation processes at typical energies of interest, signals from a single detector channel are weak. This is due to the limited opening of a detector channel and to absorption processes in the test object. The greatest losses occur on the way back from the scatter volume to the detector because due to the Compton effect the scattered photons have a lower energy than the incoming photons. high image contrasts are achievable. This means that XBT has a high potential for imaging purposes. Indeed, already 30 years ago XBT was under discussion as a promising technology for landmine detection. The main result from that time was that isotopes are not suitable for this task, and that handheld X-ray systems are not possible. In contrast to other X-ray technologies such as radiography an XBT image normally is obtained pixel by pixel. 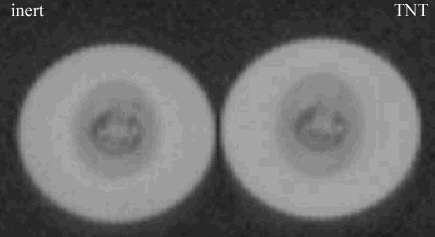 A scanning mechanism for a pencil X-ray beam is used to generate images which consist of a series of parallel layers. 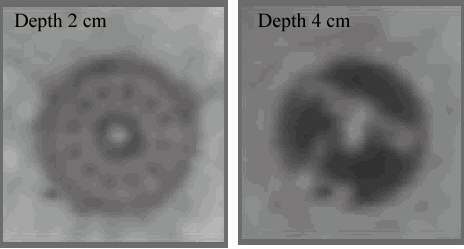 Very often, a single layer image may be sufficient to identify the details of interest. Fig 1: Outline of a mobile 450 kV prototype scanner. To demonstrate the capabilities of XBT, YXLON has developed a mobile prototype scanner to be used on military test sites. For this purpose, a scanner head was mounted on a trailer. A high flux 450 kV X-ray tube and a multi-channel X-ray detector system are the major components. The prototype scanner ComScan450 has been in use on military test sites several times. Tests were made at varying soil conditions such as humus, sand, gravel etc. Tests were also made with varying conditions of vegetation and of wetness. In the following, a limited number of examples clearly show the potential of the new technology. The greatest number of buried landmines are anti-personnel mines (APM). As long as they are visible on the ground the danger in some way is limited. However, there is a great fraction of land mines buried a few cm deep in the ground. In the following example, XBT images of a buried PPM-2 mine are shown. The diameter of the mine is approximately 12 cm, layers are shown at depths of 2 cm and 4 cm, respectively. In the first layer, structures of the top lid are clearly visible. No non-mine object in the soil (such as stones, sand, vegetation) would reveal structures like this. In the second figure, inner structures of the mine are displayed in the XBT image. A comparison to a mine photograph (fig.2) clearly shows that the most relevant inner structures are reproduced in the XBT images (fig.3). Fig 2: Photograph of an anti-personnel mine (type PPM-2). Fig 3: XBT images of an anti-personnel mine (type PPM-2). Anti-tank mines (e.g. TM-62, fig.4) are found in many regions of the world (Kosovo, Afghanistan etc.) and when buried, may not easily be detectable. In the following, some examples of XBT-images are shown (see fig.5). It is evident that the cylindrical structures of these mines can be used for identification. 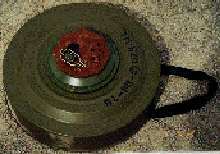 Fig 4: Photograph of an anti-tank mine (type TM-62). Fig 5: XBT images of an anti-tank mine (type TM-62). Results shown in sections 3.1 and 3.2 were obtained with mines which had been filled with some substitute material instead of the real explosive. In a few experiments conducted by YXLON, a comparison between substitute material and a real explosive (TNT) was made. In the following, results for ATM type TM-62 are illustrated (fig.6). It is evident that the image quality for the case of the TNT-filled mine is at least as good as the quality for the case of the mine filled with substitute material. 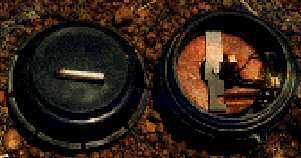 Fig 6: XBT images of an anti-tank mine (type TM-62). From the results presented here it is very obvious that XBT is the detection technology which has proven that direct imaging of buried land mines of all types is not only possible, but it can also reveal a broad range of details inside mines. Thus, with XBT a technology has been found that provides a high potential for identification of mines. A good identification clearly helps to determine the appropriate method for subsequent mine removal or destruction actions. The physical limitation for the penetration depth of XBT is given by absorption processes and by multiple scattering effects in the penetrated material. Depending on the most important parameters such as X-ray tube voltage and power, dimension of pencil beam, detector opening etc. it has been shown that XBT with a 450 kV X-ray tube has a sufficient penetration depth to detect anti-personnel mines and anti-tank mines buried in the ground under normal practices. The results presented here were obtained with a prototype scanner designed for use on certain military test fields. For real applications like mine clearance in countries such as Angola, Afghanistan, former Yugoslavia etc. the scanner head has to be mounted on a suitable vehicle. In fig. 7. an artists view of a future XBT scanner head mounted to the arm of a vehicle is given. This work on X-ray backscatter technology has been substantially funded by the Bundesministerium der Verteidigung BMVg through the Bundesamt für Wehrtechnik und Beschaffung (BWB) at Koblenz, Germany. Fig 7: Artists view of a future XBT scanner mounted to the telescope arm of a suitable vehicle. A.-C.Dubey et al., Detection technologies for mines and mine-like targets, SPIE proceedings Vol. 2496 (1995).